We have wonderful support from Whitehorse in the Yukon. Along with three sponsors we have two schools that have been doing amazing things to raise funds. I’m going to write about this in great detail in February, but initially I wanted to note that we received a cheque for $1504.15 from one of the two schools, Jack Hulland E.S, under the leadership of Sara Tillet. Just a little hint about what is to come next month – the funds raised by Jack Hulland and Christ the King in the Yukon will be directed to a very specific project . . . but you’ll have to wait until next month’s update to find out more how they raised their funds and what we are planning on using them for. Brookside Secondary School donated $200.00 which they wish to be used to purchase 5 goats. Megan and Jaslyn Gribbons raised $40.00 which they wish to be used for the purchase of a goat. Sharon Freeman also made a $25.00 donation to purchase saplings to be planted in honour of the 85th birthday of Janja Markota. Brandon and Scott, of Rolling Hills, raised $64.11 in their ‘Mad Project’. One of our sponsors, Judy McDermid, along with a co-worker Debbie Robinson, work for Public Libraries on Manitoulin Island. For years they raised money to promote literacy by operating a Reading Festival. They no longer run the festival but have decided to continue to promote literacy – this time in Kenya! 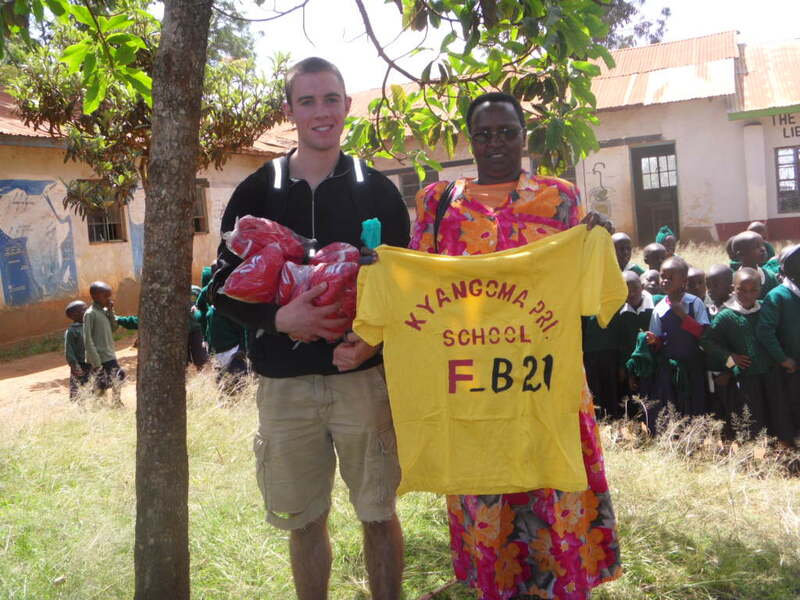 They donated the funds that remained with the program – $2172.15 – to help fund and operate our library in Kikima! We will use these funds to not only provide more books and equipment but pay the salary of our librarian for an entire year! What a contribution to literacy. In light of the fact that money from Alexander Graham Bell is also being designated to the library, we are certain that this Library will continue to meet the needs of this entire community for a long time to come. As we noted in a previous update we have established a scholarship – in honour of Andrew Curling – whose life ended unexpectedly early, to provide high school education for children in the Mbooni district. His sister held a fundraiser. Below is a letter from her. My name is Ani, I am Andrew’s sister. I know that my parents have had the pleasure of meeting you and I look forward to meeting you both as well. Our fundraiser this past Saturday was very successful. I am pleased to say that we raised just over $1800.00 (I will do a final count and give you the exact amount by the weekend). We are so honoured to be a part of this wonderful charity. Thank you so much for taking on this role and helping us to honour Andrew’s memory through the ongoing education of children in Mbooni. Three families, the Paquettes, Levesques and Nolins donated $240.00 instead of presents so that the orphans of Kikima can benefit. Our families have decided that rather than buy gifts for each other and our 6 boys this Christmas, we would like to donate to a worthwhile cause. After hearing Mr. Walters speak so passionately about The Creation of Hope on visits to our schools (2 of us teach at Anderdon Public school and he has visited our kids schools as well) we all knew where we wanted the money to go. We know we can ask for the money to be used in specific ways, but have decided to ask you to just use the money in the most productive way possible, as you see fit. Thank you for providing this opportunity. Happy New Year to everyone! While presenting at Sacret Heart CHS, a young man, Chris, gave all that he had – $5.91. Thanks so much Chris, because of you a child will have a blanket. Along the same caring manner, a number of students at Oakridge gave personal donations. Cole, $10.00; Amanda, $15.00; Ross, $10.00; Adam, $10.00; William, $8.00; Joshua, $2.00. 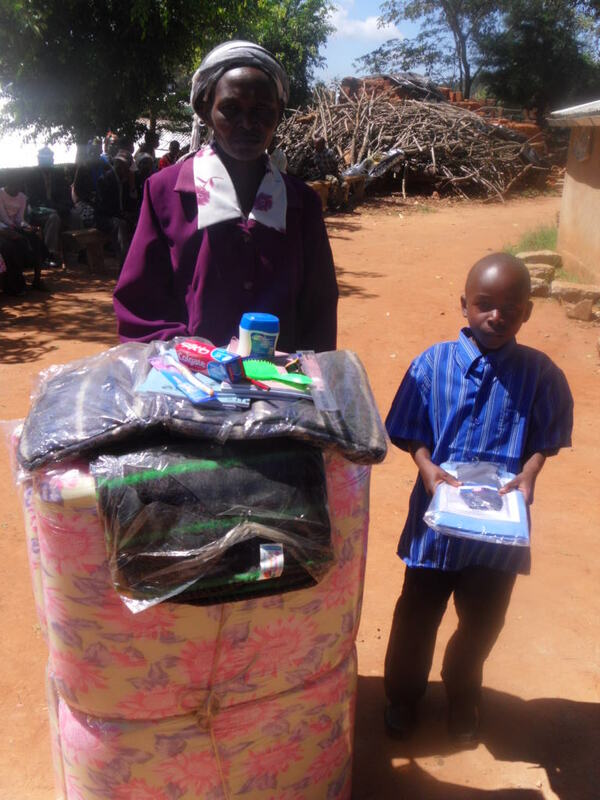 The donations of these students will result in eleven children receiving blankets. A teacher at Oakridge, Amanda LaPointe, also made a tremendous personal donation – pulling out her cheque book and donating $200.00. Her funds will be going toward the continued construction of our addition. Andy Dilla is an accomplished young man who has just graduated from University and starts medical school in the fall. I got to know Andy as part of the Impossible2Possible project where we crossed the Tunisian desert together in April 2010. He is spending two months in Kikima, living on the ground of the children’s residence and teaching at the school where the majority of our orphans attend. He has started a blog; www.andyinkenya.wordpress.com and you can follow his adventures! Andy, and Ruth, are pictured here giving out sports equipment donated by Fred Dawber in honour of his daughter Kate. Andy has spent a great deal of time at ‘Kate Stadium’ doing ‘P.E.’ with his students. The $275.00 provided by Lisgar has been used to purchase cement for the addition. All of the funds provided by Sophia Attema, in honor of her daughter Chanel, $125.00, have been directed to the garden which is planted, harvested and eaten by the children of Rolling Hills. Unlike in Canada, there is a continuous period of planting in Kenya. For an interesting account of the children helping to work the fields read up on Andy’s blog. The money provided by Woodlands Secondary School in Nanaimo, $100.00, was used to purchase timbers for the new addition. The start of the school year in Kenya is in January. In late November and early December those students wishing to enter high school must write a series of examinations. Their marks determine not only their ability to attend but what type of school they will attend. This also has strong financial implications. A student who attends a local school and lives at home can go to school for a year for as little as $150.00. However if they have qualified as being able to attend a Provincial School – one in which they will reside- the costs can be as high as $500.00 per year which covers tuition, residency, books, uniforms and examinations. We already have two children, Faith entering grade 11 and Sarah entering grade 10, but also have 9 other students who qualified for secondary education. In previous updates we’ve listed children who were funded through the efforts of Julia and Megan (The Cans for Kenya campaign at U of Guelph), donations by Sharon Freeman, and contributions raised through the Andrew scholarship. These are the children who will be attending school and the cost of their tuition. Ruth and Kay have been negotiating, equipping and then transporting and settling these students into their new schools. In one case, with Mirriam, they had to transport her all the way to the base of Mountain Kenya to her new school. Rather than a high school this is a specialized training program to give her the skills necessary to be employed and self-sufficient. In the coming update we will be specific around the schools and costs involved with these students either starting or continuing their high school educations. Below is a listing of some of the results of the exams. 4 Nduku Kalewa 318/500 YES This is the sister to Faith Mwikali (The Coopers’ child). Though not originally not on the list, she has done so well that we cannot leave her out. Their grandmother is sickly and old. Sponsors have been given individual pictures of their sponsored children receiving support, as well as wish lists being granted. Here is a picture of one of the children receiving a wish list. 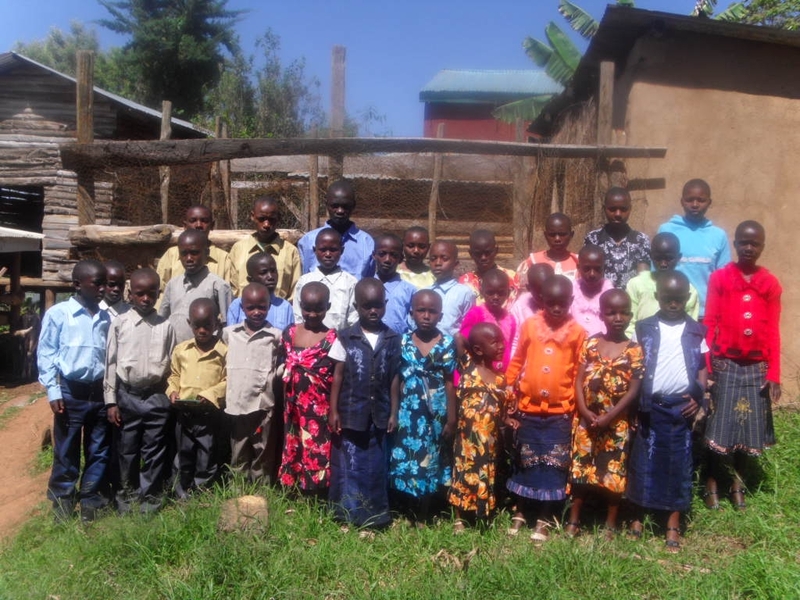 Here is a group shot of the children in the residence, all in their new ‘Christmas’ clothing. I love this picture! This has been an extremely busy time between Christmas, wish lists, ongoing construction and the beginning of the school year. There are some requests that have not been granted yet – but in the interests of total transparency (and so you know we didn’t forget!) I’ve listed them all below. Here are the requests by individuals remaining to be completed, not including the individual donations made this month. Jacqui Vanbetlehem sent $30 for a birthday gift for Mutunga Ndile. Finally here is a list of funds raised by schools (not including those received this month) that we have not, as yet, spent. In the coming two months this will all go to where it is needed.